His Holiness the Dalai Lama attaches great importance in developing compassion, as the foundation for all human relations, be they amongst family members, between neighbors or nations. His Holiness the Dalai Lama is of the view that loving kindness and compassion are of common value to all peoples irrespective of their kindness and compassion are of common value to all peoples irrespective of their beliefs. His talks on this theme have attracted thousands of people throughout the world. The Ryogoku Kokugikan is less than 2 minutes walk from Ryogoku station on the JR Sobu Line and can be seen from the station platform. Tickets are available at Ticket Pia. Arena seats 7,000yen Sold Out! Box Seats 5,000yen Sold Out! Second & third floor 5,000yen Sold Out! 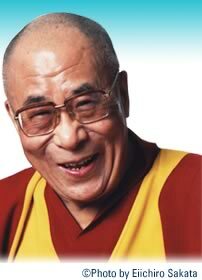 His Holiness will explain in his plain words, the Bodhichitta, as human mind to attain the Enlightenment of the Buddha. With regard to this description of The Bodhisattva Nagarujun, His Holiness has only preached once in Tibet and once in Europe. Your Name and Address: Returning card is the notice to the winner. Please show it with your ID at the entrance on the day of the lecture. Please do not write any. One card will be valid by one person for 2 consecutive days. Only one card will be valid for one person, more than 2 cards by one person will be invalid. Result will be mailed to you buy the end of March. English will be available, Please mention that you need simile translation to English. Cameras and video recorders are strictly prohibited. For security reasons, attendees and their belongings will be checked by metal detection devices at the door. Please refrain from bringing infants to any of the lectures. Please keep your mobile phone off during the lectures.